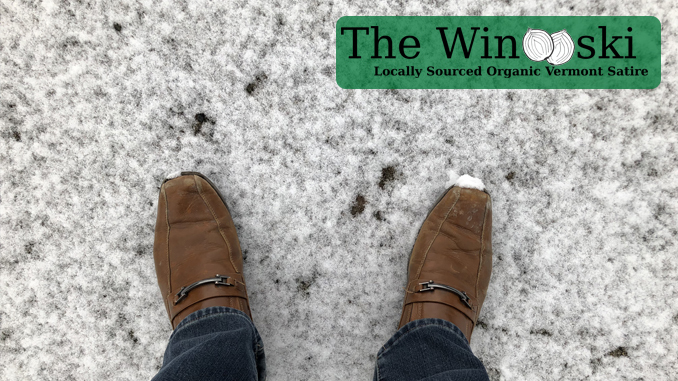 RUTLAND – A bothersome individual is upsetting neighbors and residents in Rutland again, as many reports have come in that this unidentified man insists on wearing items that do not match the current weather. He has been seen on long walks in the bitter cold with no coat on, and often wears fancy shoes in the show, showing no consideration about how that might make others feel. For most, concerned gazes and copious pointing and whispering would be enough to correct the behavior, but in this case the usual methods have been unsuccessful. Prenozzi says she has written a letter to Rep. Thomas Burditt, asking him to create a law that would force the man to at least put on a scarf once in a while, but has not heard back. We reached out to Rep. Burditt, who told us that he takes all of his constituents’ concerns very seriously and may introduce legislation on behalf of Prenozzi, although he does not expect it to pass due to obstructionist Democrats who won’t pass anything unless it raises taxes. So, at least for now, Rutland residents will continue to be subjected to people wearing whatever they want, whenever they want to.